CATS is a musical composed by Andrew Lloyd Webber and based on the poems from Old Possum’s Book of Practical Cats by T.S. Eliot. 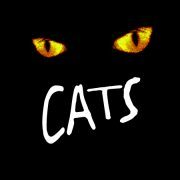 The show tells about the lives of a tribe of cats called the Jellicles, who once a year choose one of their number to ascend to the ‘Heavyside Layer’ and be reborn into a new life. The show first opened in the West End in 1981, and then the following year on Broadway. It remains the second longest-running show ever on Broadway and fourth in the West End. The show is best known for it’s song “Memory” which was released by Elaine Paige, who originated the role of Grizabella, in the show’s opening year and reached the UK top 10. A revival of CATS will be touring the UK form February 2013, followed by a season in the West End. There are also rumours of a Broadway revival too.